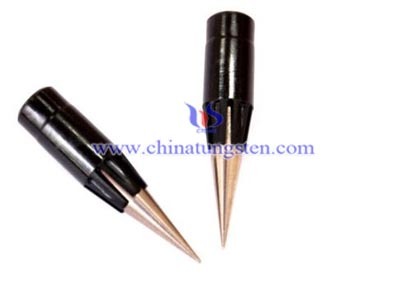 An improved subcaliber fin-stabilized penetrator projectile of equal diameter along the whole length of its cylindrical shape and consisting of high density tungsten heavy alloy metal, selected from the group consisting of a sintered alloy with high percentage of tungsten, the latter in the range of 90-98%, which has a steel ballistic hood coaxially mounted on the front end thereof and a plurality of frontal cores mounted one behind the other in an axial direction behind said ballistic hood, and a main penetrator core arranged behind said frontal cores. In tungsten subcaliber projectiles at discharge, a sabot is located between the inner wall surface of the cannon and the fin-stabilized projectile, wherein the sabot, which in a known manner serves to increase the acceleration area, is comprised of a sabot body and a sabot jacket, wherein, in order that upon exit of the projectile from the weapon barrel, the sabot can readily detach itself from the subcaliber projectile, the sabot is segmented, with the contact areas between segments on one side and between the subcaliber projectile and segments on the other side leading to sealing problems, which are overcome, in accordance with this invention, via a special segmentation of the sabot body, with longitudinal slots which include at least, in part, a T-shaped cross section, and reference fracture locations in the region of its inner diameter as well as a gas-tight seal with a concave shaped forwardly-widening seal bonnet having a closing seal. 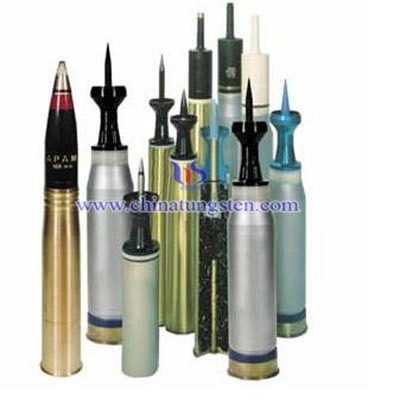 If you have any other questions about tungsten alloy swaging rod for subcaliber armor piercing projectile,please feel free to contact us by email: sales@chinatungsten.com or call: 00 86 592 5129696.